This Scholarship offer is being conducted by Scholarsmerit Online Pvt. Ltd. from 15th September 2018 to 30 September 2018 ("Scholarship offer period"). All girls below the age of 18 years, are eligible to participate in this Program subject to the terms and conditions set out herein, which will be presumed to have been accepted by him/her. Subject to the following terms and conditions, Scholarship offer is meant to help and support the education of a girl child below the age of 18 years. Therefore, only those participants who are below the age of 18 years are eligible to participate in this offer. 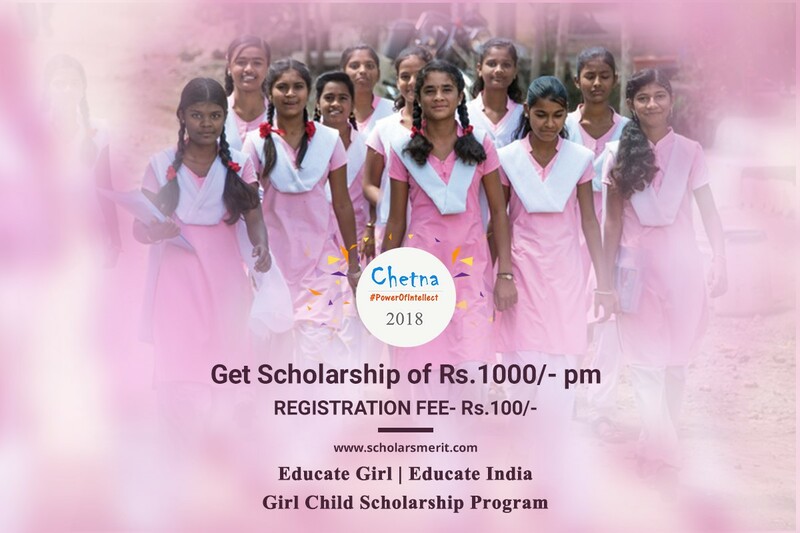 One can also get an opportunity to participate in this Scholarship offer by following Chetna Girl Child Scholarship page on Facebook.The applicant just have to signup through the page. Each winner will be entitled to only one Scholarship. The Scholarship amount shall be paid by account payee cheque to the winner i.e. the parent / guardian of the child, if the child does not have a bank account or where the child has a valid bank account, cheque will be issued in the name of the child, which shall be posted to the winner on the confirmed address (as provided in the address proof submitted with the form). Scholarsmerit shall not be liable for any loss or damage of the cheque once it has been handed over to the winner. It will be the responsibility of the winners to have the active bank account or post office savings account for realizing the cheque. In the event that Scholarsmerit does not receive the relevant documents as required within one week of establishing contact with the winner then the said winner shall be disqualified and shall not be entitled to receive the scholarship offer prize. Scholarsmerit would not be liable or held responsible for any lack or lapse in any communication on account of failure or delay by any of the Internet, Telecom, SMS and E-mails service provider. No correspondence in this regard will be entertained. The Company reserves its right to change, discontinue, extend Scholarship Offer, or modify the terms and conditions thereof without giving any prior notice. Please check out the video for registration process here How to register? You must have Scholarsmerit Account to register for this event. In case you don't have an account, you must create one by clicking on 'Login with Your SM Account' and this will take you to www.scholarsmerit.com. On New Screen for new comers, Click on 'I don't have SM Account' to register to the system. This is a onetime registration and will help you to enroll future scholarships without any hassle. Fill your details like: Name/E-mail/Mobile. Your E-mail Id or Mobile Number will the login name for you to login into the site from next time. Select Role: Student and press Submit or Register (As the case may be). Set Password according to instructions given. Your password should be more than 8 characters long with at least 1 Capital Letter, 1 Number and 1 special character to provide maximum security to your account. After Password is updated, you will be directed to CHETNA PROGRAM PAGE. Read and select Terms & Conditions to accept the conditions setup for the program. Clicking on 'Enroll Now' will display a pop-up of "Student Registration Form". This registration form is necessary for the student to fill to make her entry applicable for the program. Once the form is entered completely then please click on 'Submit'. Once your details are entered for the program. You are required to pay the fee for the program that is INR 118.00 (inclusive of GST). This will be a guided process where you need to Buy a subscription and You will be directed to Cart Page. From the Cart Page, please click on 'Proceed to Check Out'. Select Payment Method, click on Place Order after which you will be linked to payment portal page you have selected and Pay Now. After Payment you will be automatically directed to CHETNA PROGRAM PAGE. Your entry is now valid for the scholarship program. We will contact you for any further document requirement or your school for the verification of the details. Scholarship test will be opened for public on 27th January 2019. The details for the test will be displayed on or after 15th January 2019. Please check back the portal with your login to get the instructions on how to launch the test and take it further. The Chetna Examination is of 70 minutes duration and will be conducted online both in English and Hindi language. It has 3 sections having 50 questions in total with a maximum. There is no negative marking. Candidate must clear sectional cut-off to qualify and total cut-off as well.